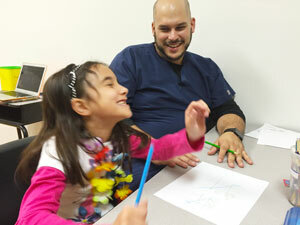 Kinetic Kids has been providing direct pediatric therapy services for more than 10 years. Hundreds of children have been successfully treated at our centers. We provide expert one-on-one sessions to children with special needs as well as offer support and learning opportunities for their families to help each child reach his or her developmental milestones needed to function successfully in everyday environments like home, daycare and school. Parents depend on Kinetic Kids to be a leader in the latest evaluation and treatment methodologies for children with special needs—children who deserve the best therapy services available, at centers purposefully designed for pediatric care. Our facilities are among the best staffed in South Florida. The first years of life are critical to a child’s development. We believe children with special needs can make the greatest progress through direct care provided by our experienced and dedicated licensed therapists. We work together with you, the family, to build a sound foundation for your child’s learning and development. Why are therapy services important? Children grow and learn at their own pace. Those first smiles, first words and first steps bring parents joy—no matter when they happen. Some children need a helping hand to achieve these milestones. That’s when your child’s doctor may recommend speech language services, hearing services, occupational therapy services, physical therapy services and behavioral services at Kinetic Kids. The goal of therapy services provided by Kinetic Kids is to help each child reach his or her full potential, and to participate in school and routine childhood activities to the greatest extent possible. We also empower families through involvement and education beginning at the time of their child’s evaluation. Chronic childhood developmental and neurological problems can affect children’s hearing, speech, behavior, cognitive and motor skills. Many children who are born prematurely may also benefit from therapy services. After a serious illness or injury, children may lose some of the developmental skills they’ve already mastered or experience behavioral challenges. Speech language therapy, occupational therapy, physical therapy, and applied behavior analysis may each have a role to play in this recovery.